Providing you the best range of brass hex with effective & timely delivery. 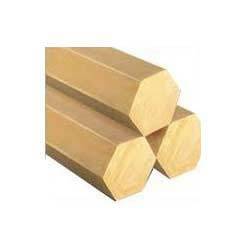 Brass Hex Bars are available with us in a wide range of shapes and material grades. Here, these hex bars offer an excellent choice for applications requiring attractive finish appearance as well as corrosion resistant finish properties. The possibility of these brass hex bars to be easily drilled, machined as well as sawed also make these the preferred choice of the customers. Some of the possible end use includes as base plates, decorative work and other applications like Marine Hardware, Automotive parts, Fasteners. Looking for Brass Hex ?